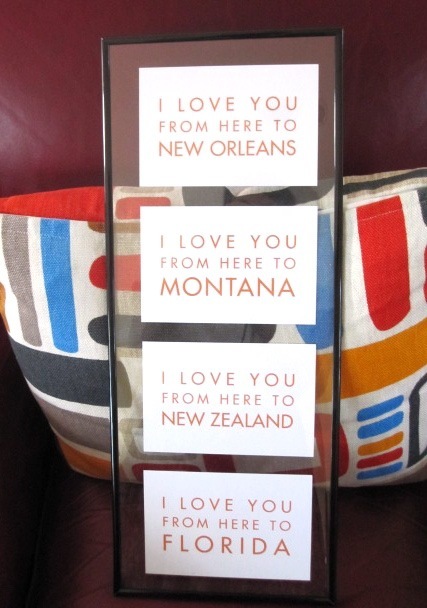 From the start of planning our wedding, it was really important to me to represent the different places we had traveled to and lived in the past three years. I felt like it was a big part of who we were and everything we were capable of accomplishing in just a few short years together. However, I struggled with different ideas of how to express these feelings until I found this brilliant etsy shop. We ended up placing each card on a different table during our reception and I loved the simple way they allowed me to communicate our spirit of adventure. Yes, I just used the words “spirit of adventure.” Bite me. While the prospect of being a wife filled me with terror (and excitement, of course), the reality is quite lovely. Especially, my new health insurance card and, more importantly, my husband who brings me flowers when he comes home from work and pretends he likes my attempts at cooking spaetzle (note-to-self: do not attempt to cook foreign dishes while under the influence of a bottle of foreign wine). This entry was posted in Family, Wedding. Bookmark the permalink.